As a special treat we were allowed to climb in the sun, with broken cloud and a gentle breeze making for comfortable conditions. 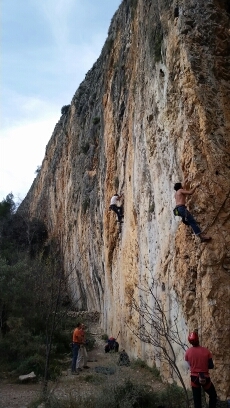 We went to a “secret crag” near Alcoy, which Helen and I had discovered in February. Plenty of locals out, enjoying the awesome routes. An appealing arete that I’d noticed last time has now been bolted to give a great 35m 6c. 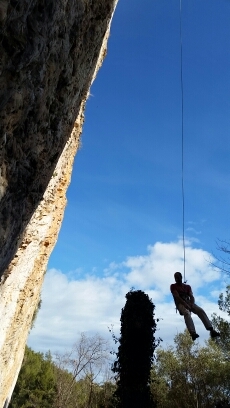 Further up the crag, Jake made fast work of a 7b and a 7b+ – both over 40m long and still pretty steep. 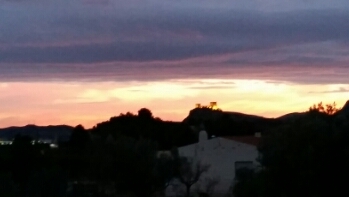 Then back to Mike and Heidi’s place for burritos with a Spanish twist washed down with a bottle of Cava and views of the sunset over the castle above Sax. Great way to see in the New Year!